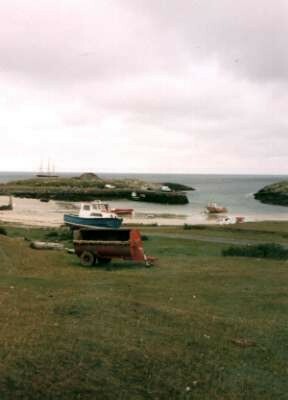 Scarinish, the main township of the Island, is the first to greet the visitor arriving by boat. The township boasts two piers, the more modern being owned and maintained by Calmac and the berth for the ferry which brings passengers, vehicles and freight to the island on an almost daily basis. Sailing times change in the winter so checking with the main Calmac office in Gourock or web site is advisable.. The older pier is still used by fishermen, but was once the main port of departure for small, open boats called sgoithean which plied between the Ross of Mull and Coll for the peat cutting. Tiree had no great reserves of peat, being mostly grassy machair. This practice ceased when Tiree boats, crewed and skippered by Tiree folk who had left the Island, brought supplies of coal from the Ayr, Irvine and Ardrossan. About 30 sailing ships were involved in supplying the Island until the advent of steamships. Sailing ships had made Tiree mariners famous all along the west coast, from the Isle of Man in the south to Shetland in the north. Today Scarinish boasts the main Post Office for the Island, a butchers, D.A. MacLean, the Co-Op, the Police and Fire Stations, and the Royal Bank of Scotland. A recent addition to the township is a museum, An Iodhlann, the storehouse, which houses all the archives for the Island. The museum stages exhibitions, the most recent being "The Wind That Shook The Barley", tracing the influence of the second world war on the community. 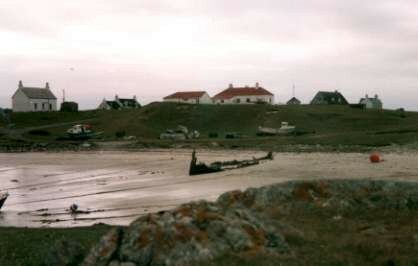 Tiree was a base for halifax bombers. It is also the first port of call from many visiting Tiree who wish to trace their roots. Dominating the township is the BT repeater station from which, at various points in the day, strange sounds emanate from, bird scaring tactics to discourage seagulls from nesting in the satellite dishes. There is the possibility that mobile phones may be used on the Island in the near future when the technology has been installed, strange to think that BT is so behind in one area of technology whilst it boasts having numerous isdn lines installed all over the island.